Folding wagons are more of a mystery. Nobody seems to talk about them or even give some pointers when picking one. There is very little information available and to top it all up, there are not that many brands that offer these types of wagons. Most of the folding wagons available are basically the same model but with a different color and branding. It gives a false sense of diversity when in fact there is none. Picking 10 models for our list has proven to be quite challenging mainly because there seems to be a lack of diversity. The folding wagons that made it to our list follow the same pattern. They are compact, foldable and can support a decent amount of weight. Pricing has also played an important role since there is no valid reason to pay a premium for such a product. Here is what we managed to pick for our list of the top 10 best folding wagons. 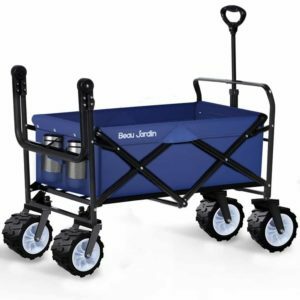 The Beau Jardin folding wagon is a good pick for the ones that need a practical means of transporting cargo. Being foldable makes it much easier to store the wagon itself but it is still sturdy and durable when loaded. Using a durable frame, the wagon will be able to support loads of up to 300 pounds. It is quite large comes with caster wheels. The wheels have rubber tires that help reduce shocks. It even has two cup holders in the front side. Looking at the functionality of the wagon, the model comes with 360 degrees beach wheels and an ergonomic adjustable handle. The handle itself is telescopic and can be adjusted. 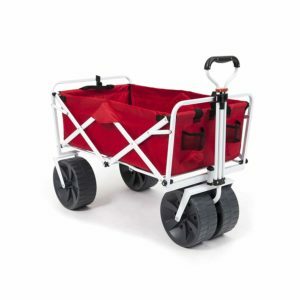 Folding the wagon is extremely simple and it is light enough to be carried in one hand. 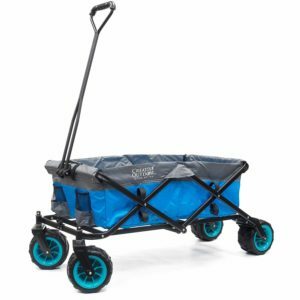 Creative Outdoor all-terrain folding wagon is more of a multipurpose product that can be used for pretty much any application as long as the weight of the load does not exceed 150 pounds. It is made from 600D polyester which should provide enough strength. 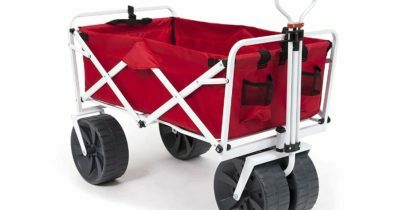 The wagon uses a steel frame and large adjustable wheels. To better absorb impacts, the wheels were made from a rubber material. Folding the wagon is done by pulling on the string in the middle of the floor which will make it take very little storage space. As far as practicality goes, the wagon does not stand out very much. It has 2 cup holders in the front which will prove to be useful. The polyester cover can be removed so that it can be easier to clean. The WonderFold heavy duty folding wagon will prove to be a reliable product for the ones that find themselves in need of transporting loads without having to come to a large and difficult to store wagon. To make it as practical as possible, the model was made using a lightweight metal frame that can support loads of up to 164 pounds. For the wagon, a polyester fabric has been used that can be removed and washed by hand. Also, the rubber tires will help reduce vibrations. Storing the wagon will prove to be not much of an issue since it becomes very compact. It weighs about 26 pounds making it not to difficult to lift it up and move it around. The handle is telescopic allowing it to swivel 180 degrees. Mac Sports heavy duty foldable wagon was made to provide a lot of utility in a compact form factor. The wagon can be folded by just pulling it from the middle and can be carried with the aid of two small handles. 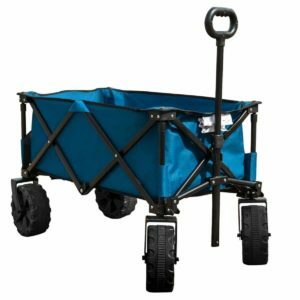 The construction of the wagon is decent using a metal frame and a 600D polyester fabric. The cover itself can be removed which makes it much easier to clean. It also has 2 cup holders sewed in the cover on the front side. As far as practicality goes, the wagon is very easy to fold. It is not that heavy and can be carried around without many issues. The handle can be adjusted. Additionally, the wagon features a foldable tray on the rear side. Mac Sports heavy duty folding utility wagon is a great accessory to have around especially when having to move equipment. Despite its compact size, the wagon can hold loads of up to 150 pounds without any issues. 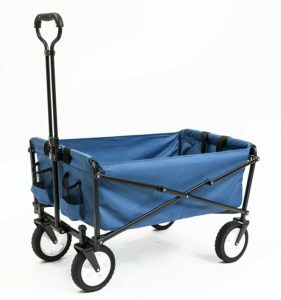 The wagon has a basic design with a metal frame and a removable 600D polyester cover. Being removable makes it easy to clean but it should be hand washed only. The wagon itself weighs about 22 pounds and has very compact dimensions when folded. Looking at practicality, the wagon comes with a small cover and a handle to make it easy to move around. The wheels have a rubber coating that helps reduce vibrations and the design makes it possible to set it up in just a matter of seconds. 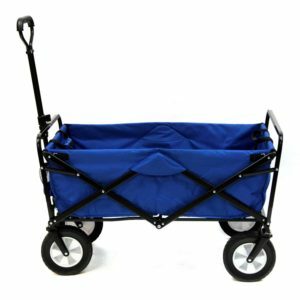 TimberRidge folding campaign wagon is a great pick for the ones that are looking for something cheap and functional. The wagon is similar to some of the other models on our list. It has a metal frame that can support loads of up to 150 pounds and large wheels that can help reduce vibrations from small shocks. Folding and setting up the wagon takes just a few seconds. 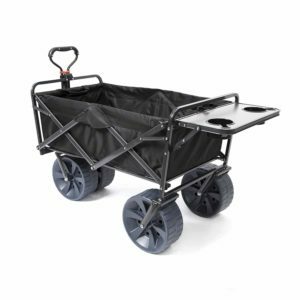 The cover for the wagon is made from a durable 600D polyester fabric that is easy to clean and was made to be tear resistant. In terms of functionality, the wagon comes with an adjustable handle. The wheels rotate to make it easier to move around while the handle can swivel 180 degrees. The total weight of the wagon is about 25 pounds. Seina folding utility wagon is one of the most affordable wagons on our list. 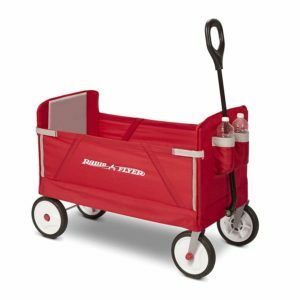 It is a simple wagon with a basic steel frame that does not need to be assembled and takes just a few seconds to open and fold. The wagon is also quite light in terms of weight. It is just 13.5 pounds heavy making it very easy to carry around. The cover is removable and can be hand washed. Being made from 600D polyester fabric means that it is tear resistant. In terms of capacity, the wagon can handle up to 150 pounds. It is not recommended to be used in commercial applications but it can be a great choice for a day at the beach, moving equipment or transporting small items. 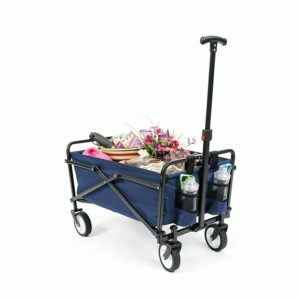 YSC folding wagon is a great all-purpose model that is both inexpensive and practical. The model is constructed to be able to handle loads of up to 150 pounds and take very little storage space when folded. The wagon features two bottle holders in the front and an adjustable handle. It does not require any kind of assembly and takes just a few seconds to fold or open. The wagon weights just around 10 pounds making it easy to carry when folded. Despite being so inexpensive, the wagon is well made and durable. The 600D polyester cover can be removed which means it is easy to wash and maintain clean. To reduce vibrations, the wheels used are made from soft rubber and can spin. Radio Flayer folding wagon is one of the cheaper models that was selected for our list but it is just as good as the ones that are twice the price. Despite having a lightweight frame, it can carry loads of up to 150 pounds. The cover for the wagon is removable and very easy to take off and clean up. It has Velcro straps to secure it in place and zippered sides. On the front, the wagon comes with two bottle holders. The front and back wall have been raised and reinforced. As with most other wagons, the handle is telescopic. The wheels are quite large and spin freely to make the wagon easier to maneuver. It has rubberized tires in order to reduce vibrations. 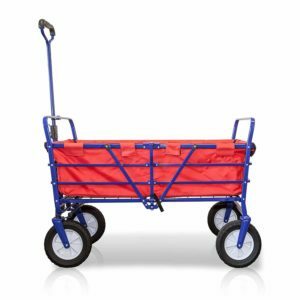 Mac Sports folding wagon is one of the best deals available. It is an inexpensive wagon with a solid construction but reasonably lightweight. It takes just a few seconds to fold it or set it up and does not require any kind of assembly. The wagon uses large wheels with rubber tires that help it absorb vibrations better. The front ones can spin which makes it easier to maneuver around. As for the handle, it telescopic and can spin 180 degrees. Setting up the wagon takes just a couple of seconds. All it takes is to pull up from the middle. The cover is made out of 600D polyester and can be removed and hand washed. As for capacity, the wagon can support up to 150 pounds. Folding wagons need to be reliable ahead of anything. Most of them are made following the same design and they fold in the same way. One thing that most people tend to forget to think about is the wheels. The wheels need to be large and have a rubber tire, otherwise, everything it carries will be susceptible to hard vibrations. Since most wagons are fairly the same, getting a decent one is not that difficult. There are some things to keep in mind but for the most part, even the cheapest wagon should do. Here are some things worth keeping in mind. Capacity: The vast majority of folding wagons can carry loads of up to 150 pounds which is decent enough. A few other models can hold up to 300 pounds but it is highly unlikely that they are large enough to actually hold so much cargo. Wheels and handle: In order for a wagon to be easy to handle and keep the items that are being transported safely, it needs to have decently large wheels with rubberized rims and a telescopic handle that can swivel. Setting the wagon up and cleaning it: A folding wagon needs to be easy to setup. If the design is well thought out, it should take a few seconds to fold it and set it up. Also, the polyester fabric that covers the frame needs to be removable so that it can be washed. Even the cheapest folding wagon can be reliable and sturdy enough. As most folding wagons are made with a metal frame, they should cargo up to 150 pounds. The most important part is for the wagon to be practical. For folding wagons, practicality means that it is easy to store, lightweight so that it can be carried around and easy to handle. This means a telescopic handle and swiveling wheels. Fortunately, all the wagons that were picked for our list have all these features and it is difficult to go wrong with any of them.